This 50W YYC slim line IP65-rated LED floodlight offer a modern aesthetic with a compact streamlined design, this not only makes it less obvious in situ but this LED floodlight delivers an amazing amount of light for a small amount of electricity. These lamps are direct replacements for your existing halogen, metal halide or SON floodlights. They are the ideal solution for positioning at the entrance to properties, in small courtyards or along alleyways between houses for added security or just for decorative lighting. With a reliable aluminium alloy corrugated-fin design to increase the cooling area whilst reducing product weight, this slim line LED floodlight also features a high-quality, high-efficiency constant current driver ensuring light stability, and greatly reducing power consumption. 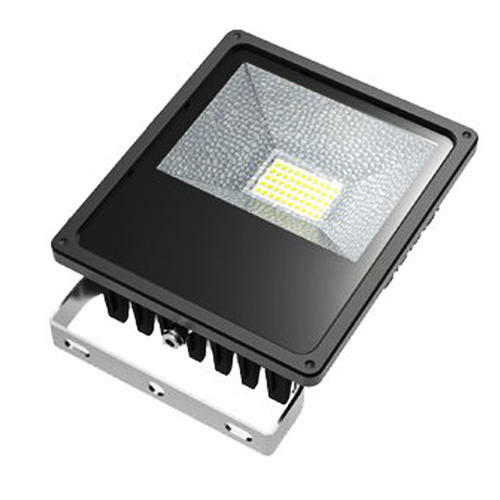 The SMD LED light source provides low light decay, with a high colour rendering index, delivering stable light colour and low glare. This LED floodlight contains no mercury, no lead, or hazardous substances and produces no UV, infrared or radiation.